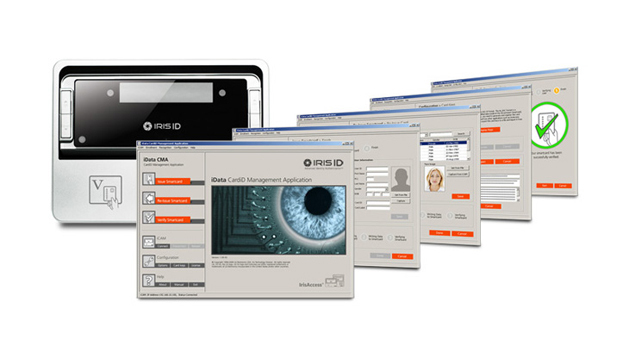 The IrisAccess CardiD Management System (CMS) is a part of the world’s number one deployed iris recognition platform. Increased versatility and flexibility makes card configuration, iris enrollment and verification easier than ever. An intuitive visual user interface combined with audible prompts enables users to quickly enroll and verify either one or two eyes virtually simultaneously. The IrisAccess auto-tilt camera adjusts to the user’s preferred height and angle immediately after the smarcard is presented to further increase speed and convenience. When it comes to dual-factor authentication, the IrisAccess CardiD Management System is extraordinarily flexible. The combination of iData CardiD Management Application (CMA) and IrisAccess iCAM4010V-H1 with a device-embedded smartcard reader from the world’s leading card reader producer HID, allows seamless integration with HID iClass smartcard solutions all around the world. iData CardiD Management Application (CMA) software incorporates a unique functionality called iDentityCheck that performs a “one-to-many” search using iris against a database of enrollees to prevent duplicate enrollments. This feature is automatically activated during the enrollment process of the iData CardiD Management Application. iCAM4010V-H1 with an embedded HID iCLASS and CardiD Management Application deliver a secure and simple card issuance, re-issuance and verification solution. One or two iris templates (approximately 512 bytes each, 603 bytes each with encryption) can be efficiently written to smartcards. When smartcards are used, a central database is optional and there is no need to poll a database to make an authentication decision. In the 1:1 verification mode, the smartcard is placed against the iCAM directly over the card reader icon. The iris template is read from the card and the card holder is prompted to look at the camera where an iris image is captured. If the template generated from the “real time presented iris” matches the stored template on the card, verification is successful. When verification is made, a Wiegand output is sent to the access control panel. Access is granted or denied as defined by predetermined security policies in the access control panel. The iris camera imager automatically adjusts to user’s height and angle when smartcard is presented.